Network Time Protocol (NTP) is one of the oldest Internet protocols. It is used for clock synchronization between computer systems over packet-switched data networks. Because it was designed to operate in variable-latency environment, NTP can achieve up to 1 millisecond accuracy in local area networks and tens of milliseconds when running over the Internet. NTP can be a very useful tool especially, when we want to correlate issues during network failures. It is important to remember that NTP uses hierarchical system of levels of clock sources, which is called a stratum. At the top of this hierarchy we have a stratum-0 devices, which act as a reference clocks. These are usually atomic clocks which has little or no delay associated with it. The reference clock typically synchronizes to the correct time (UTC) using GPS, Irig-B, etc. Devices which are directly connected (usually via RS-232, not over a network path) to the stratum-0 servers are called stratum-1 servers. 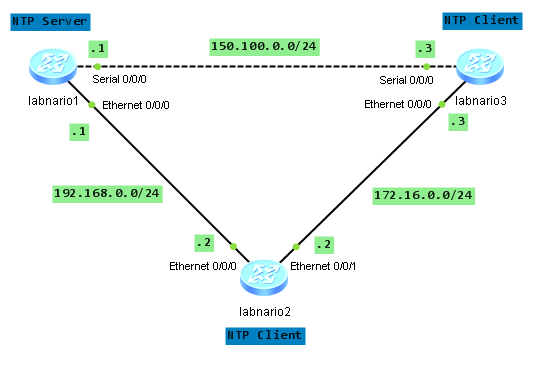 Stratum-2 server is connected to the stratum-1 server over a network path. Thus, a stratum-2 server gets its time via NTP protocol from a stratum-1 server. A stratum-3 server gets its time via NTP from stratum-2 server, and so on. So the stratum level simply defines its distance from the reference clock. How to configure NTP on Huawei devices? Labnario1 router to be the NTP Server with the stratum being 2. Labnario2 router to be the NTP Client of labnario1. Labnario3 router to be the NTP Client of labnario1. In case of the serial link failure, Labnario3 should synchronize its clock with labnario2. As you can see, labnario2 treats labnario1 as a reference clock and has a clock stratum of 3. This means that it is one level below labnario1 in the NTP hierarchy. Let’s look how this association works. This type of association is created upon arrival of a client request message and exists only in order to reply to the request, after which the association is dissolved. Labnario2 is in client mode in its association with labnario1. Labnario3 is now synchronized with labnario1. Let’s check what happens when labnario3 looses its connectivity with labnario1. 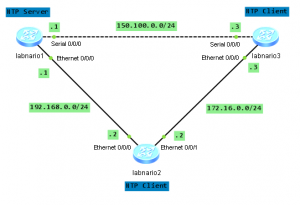 To do this, I want to remove IP address configuration from serial interface of labnario1. Nov 11 2012 20:29:27-08:00 labnario3 %%01NTP/4/PEER_SELE(l):The peer selected by the system is 172.16.0.2. Now labnario3 takes its time from labnario2. As a result, clock stratum has changed to 4. This is because now we have one hop count more to labnario1 after topology change. Nov 11 2012 20:43:52-08:00 labnario3 %%01NTP/4/PEER_SELE(l):The peer selected by the system is 150.100.0.1. Labnario3 now synchronizes its clock with labnario1 again with a clock stratum of 3.